The Sicilian court in "A Winter's Tale"
I won't mince words. The Shakespeare Festival St. Louis production of Shakespeare's 1610 comedy/drama The Winter's Tale, which runs through June 25th, is seriously great theatre. It demands to be seen. This isn't just one of the best Shakespeare productions I've ever seen, it's one of the best productions of any play I've ever seen. It's superbly acted, beautifully designed, and directed in a way that shows a deep understanding of and respect for the text-something far too many Shakespeare directors seem to lack. A Winter's Tale is often regarded as a "problem play" because of the way it shifts abruptly from tragedy to bucolic comedy to redemptive romance. Some critics have seen that as a weakness, but director Bruce Longworth, in his program notes, begs to differ. "I think it's a strength," he writes. "Life can turn on a dime and frequently does: laughter in the morning, tears at night…Shakespeare understood this and embraced it in his story-telling." Mr. Longworth goes with Shakespeare's flow, setting a brisk pace and allowing the feel of the production to change along with Shakespeare's text. And those changes are significant. For its first three acts, A Winter's Tale is a dark tale of jealously and paranoia run rampant, as Leontes, the King of Sicilia, effectively goes insane and accuses his pregnant wife Hermonie of having an affair with Leontes' long-time friend Polixenes, the King of Bohemia. By the time Shakespeare's third act (and this production's first) ends, there have been multiple deaths and Leontes realizes, too late, how much damage he has caused. The last two acts, which take place sixteen years later, are mostly taken up with rustic comedy in Bohemia, as Polixenes' son Florien woos the girl he believes to be a shepherdess but who is actually the supposedly dead daughter of Leontes and Hermonie. Everyone eventually winds up back in Sicilia for a wildly improbable happy ending. This could all be a mess, but under Mr. Longworth's skilled guidance this outstanding cast makes it all work. Their obvious comfort with Shakespeare's language allows them to communicate every nuance clearly with the audience who, the night I saw the show, were rapt from the first scene. 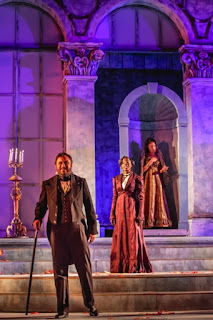 Charles Pasternak perfectly conveys Leontes' madness and remorse, Cherie Corinne Rice is a perfect picture of wounded innocence as Hermonie, and Rachel Christopher makes Hermonie's gentlewoman Paulina a tower of righteous strength as she defends Hermonie from Leontes' lunacy. Anderson Matthews is a wonderfully sympathetic Camillo, torn between what Leontes wants and what he knows is right. And Whit Richert's performance as the Shepherd who rescues Leontes' infant daughter from the elements is a comic gem. Ditto for Gary Glasgow as the rogue Autolycus, deftly picking pockets and bursting into song. In fact, there is not a weak performer in this ensemble. Rather than list them all here, I'll just refer you to the Festival's web site. Scenic Designer Scott Neale and Costumer Designer Dorothy Marshall Englis set an appropriately fanciful tone, placing the action in a kind of vaguely 18th century Neverland. And the live music by Matt Pace, Brien Seyle, and Emma Tiemann adds an extra bit of polish to the show. 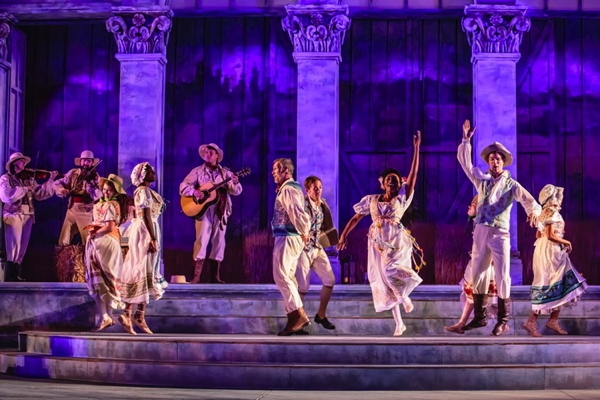 The Shakespeare Festival St. Louis production of The Winter's Tale is performed nightly at 8 in Shakespeare Glen across from the Art Museum in Forest Park, although the pre-show entertainment starts at around 6:30. You only have a few more days to catch this beautiful and completely entertaining event; don't miss it.